is worth whole years of those mean observances of paltry decorum. 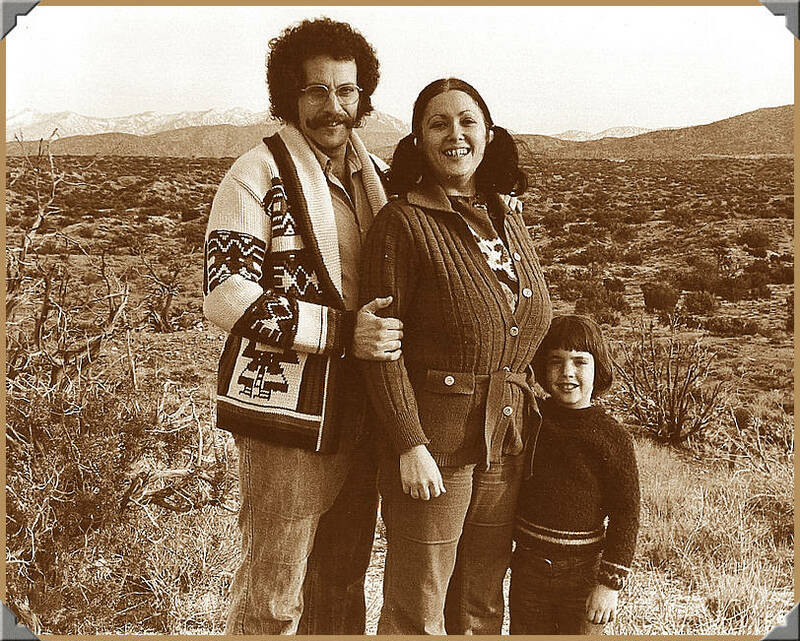 I convinced my wife, Barbara, that we will have a GREAT time going there with our son Danny, who was 5 years old. We planned to go for the weekend of Halloween to make visiting a ‘ghost town’ more exciting. We planned to camp there if we could. …with all the goodies we wanted or thought we needed, plus a mattress in the back for sleeping, an extra 5-gal. can of gas, extra oil, oil filter, spare spark plugs, points, rotor, condenser, cap, wires, tools, 2 spare tires, etc. I was a mechanic, y’see, and would ‘be prepared’ for just about ANYTHING! I also packed my S&W .38 revolver (for protection from who knows what), my trusty ol’ Red Ryder b-b rifle (for plinking fun), CB radio (it was WAY-before cell phones were commonly available), 5-gals. of water, food, drinks, fresh fruit (gotta fend off scurvy, ya know! ), munchies (yessss, m.u.n.c.h.i.e.s.! *DUH! *), and some other stuff, too! 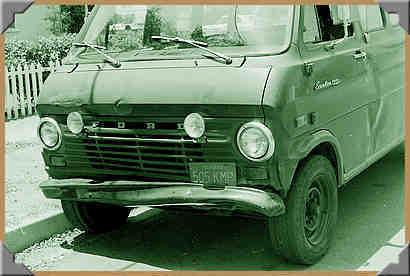 1970 Ford E-100 – not ours! This pic is NOT our van! 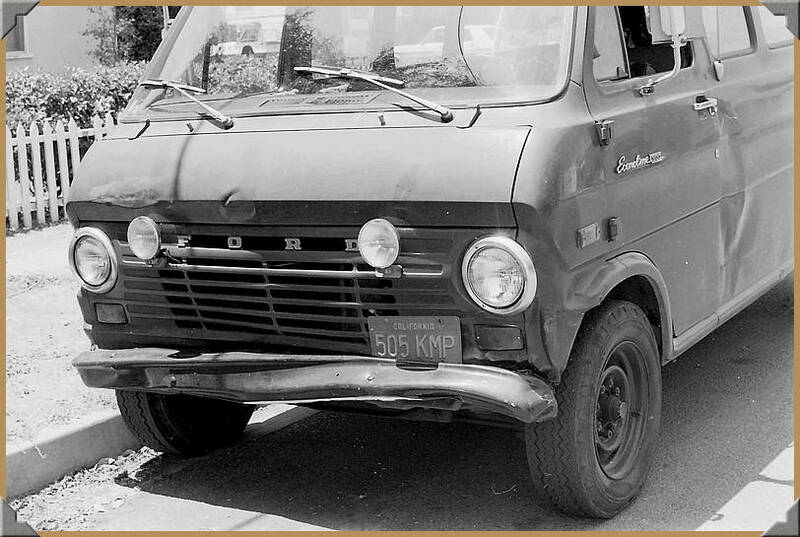 Ours was an E-300 1-ton van with a 302 hp V-8, auto, with about 200,000 miles at this point, and not a body panel without a dent! So, on Saturday morning, quite early I’m sure, we headed off to the wilds of East-Central California, with the hand-drawn map and an old road map of the area. No GPS, no cell phone, just good ol’ ‘seat-of-the-pants’ driving fun, and a great sense of adventure! This was how we always set off on our trips, with a roll-call. Louder and longer shouts. Then lots of giggles. 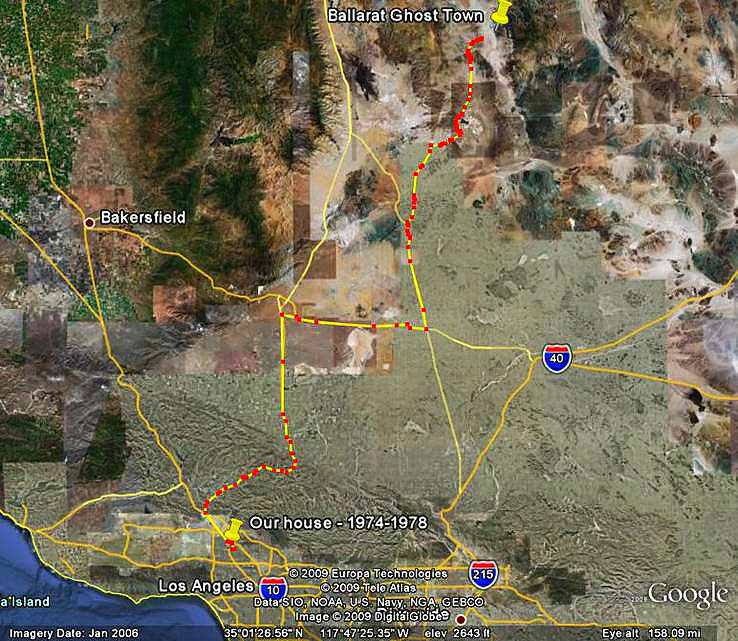 (…to the tune of “Route 66” by Nat ‘King’ Cole) …past Palmdale, then Lancaster, through Mojave, still on Rte. 14, but now named Sierra Hwy. 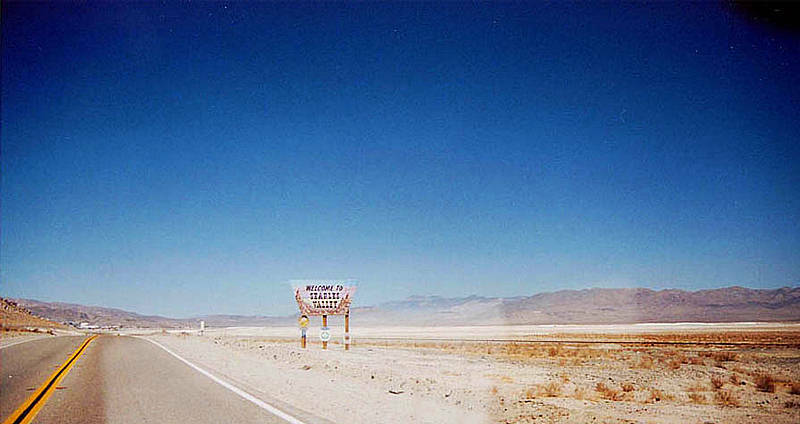 Then East on the Mojave-Barstow Hwy., meeting up with Rte. 58, through Boron, then North on Rte. 395 at Kramer Junction. This turned into the 3 Flags Hwy. …Atolia, then Red Mountain. Then we picked up Trona Rd. between Red Mountain and Johannesburg. 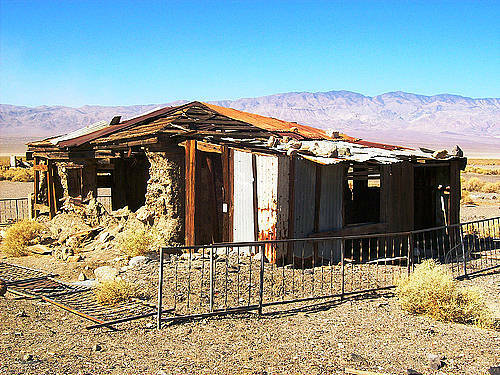 Trona Rd. later meets up with Rte. 178, and we turned NE, continuing on Trona Rd. Eventually we went through Westend, then South Trona, Borosolvay, Argus, then Trona. For quite some time Searle’s Lake (dry) was on our right, to the East. 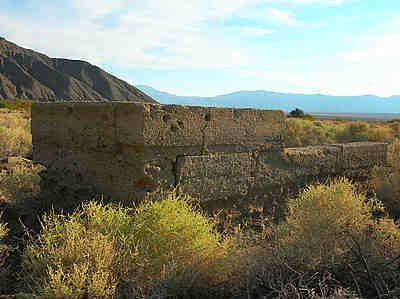 We were looking for a sign somewhere along between Pioneer Point and Trona (I think) marking the dry lake. Next we were looking for Ballarat Rd. 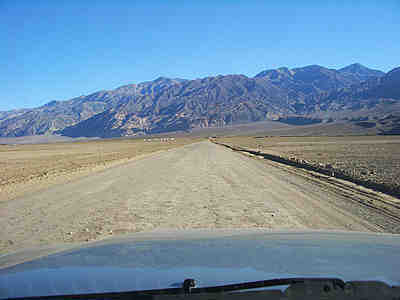 We were still travelling North on Trona Wildrose Rd., Rte. 178. About 15 mi. farther we finally spotted Ballarat Rd. heading East from a sweeping left curve, so we left the pavement and turned onto a packed sand road. Ballarat Rd. heading East towards the Ghost Town. We drove about 3.5 mi. over an easy graded road, arriving at Ballarat Ghost Town. No signs that I can remember, no commercial buildings, nothing but some bumps in the sand. Remember, this was 1976! As we got closer it was apparent that this was the ghost town as described on my map. It was cause for excitement just being off the paved road and driving toward the Panamint Mountains in the distance! 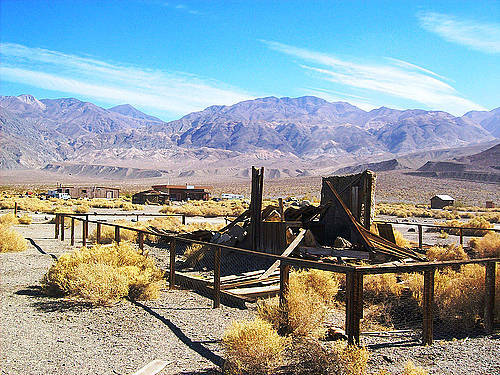 The ghost town consisted of a group of maybe a dozen wind-worn and sand-covered foundations just barely visible, and there were 2 or 3 structures where you could see the bottom rows of stone foundations. There was one spot that had part of a wall still standing, maybe 6 feet of it, but not much else. There were a couple of wind and weather-torn cabins. Ballarat ghost town. There were no fences when we were there. Ballarat Ghost Town partial foundation. Are those bullet holes? (note regarding images posted in this story: I found these images online during my research of our trip. They were shot much more recently than when we were there, so please keep that in mind. Places and things change over time. I will try to describe what you are seeing and what we actually saw when we were there. I will add dates to the photos when I find them. O-KAAAAY… so we looked around at these decrepit structures, saw that we wouldn’t be camping in the ghost town, and decided to move on. We checked the map and the lay of the land, looking for the trail to take us to Goler Wash, which was supposed to be marked by a huge boulder. We went South on Wingate Rd. which runs along the base of the Panamint Mountains. This would eventually lead us to Goler Wash on about 14 miles of graded road, meaning lots of washboard, holes and some rocks to dodge. 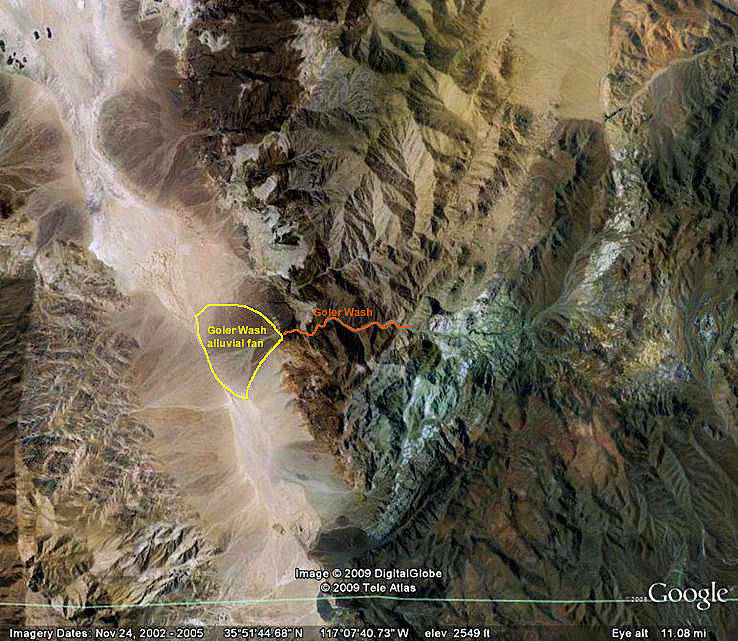 As we approached the alluvial fan of Goler Wash we could see a bunch of vehicles parked in a group. There might have been 10 or more trucks, some of them with trailers attached for hauling horses or dirt bikes or 4-wheelers. There were small groups of people with these horses or vehicles going to and from the trail that headed into the mountains that loomed right beside us. [I have to pause here to relate this moment in time to you. 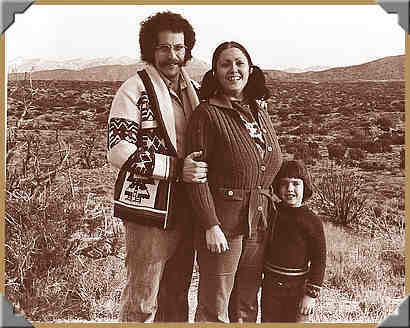 Remember, it was way back in 1976 that we were there. There have been more than a lot of miles traveled since then, so memories are a bit faded, and I don’t have many photos to reinforce the memories. *knocking myself on the head for being so stupid* I am, however, collecting images from around the internet to help illustrate what we were seeing. On the GE maps there are numerous trails apparently carved out by groups of 4-wheelers, etc. Back when we went there, there were mostly dirt bike tracks and horse tracks, with only a few 4-wheel-drive vehicles going there. 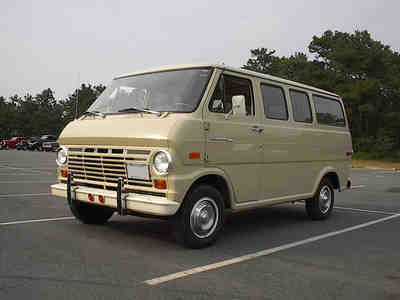 And keep in mind, our van was 2-wheel drive!